Spider silk is about four or five times stronger than steel, but it is remarkably lightweight. So, what would it feel like to walk around in a suit woven of the stuff? Spiber, a startup in northern Japan, is showing off a dress made from synthetic spider silk. The firm is one of looking into how to make and use artificial spider silk, a task that has proven to be very challenging for scientists. 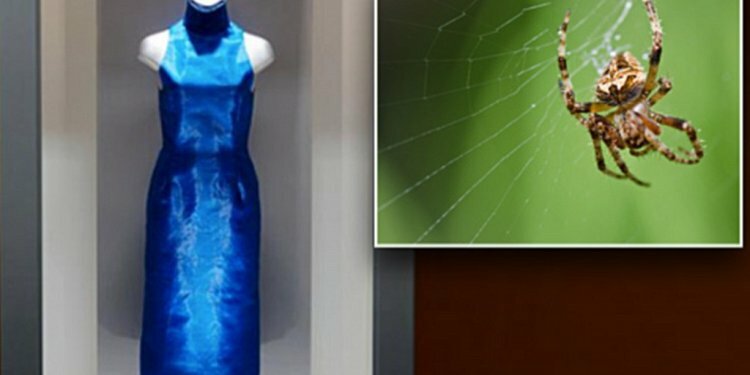 The electric-blue dress was created from a material Spiber calls Qmonos (from kumonosu, or "spider web, " in Japanese). The material is extremely strong and more flexible than nylon. The high-collared cocktail dress, on display at the Roppongi Hills complex in Tokyo, was created to demonstrate the technology behind Qmonos. The territorial nature of spiders makes them difficult to farm like silkworms. So instead, Spiber developed a technology that uses synthesized genes and coaxes bacteria to produce fibroin, the structural protein in spider silk. Spiber then uses technology it developed to culture the microbes efficiently and weave the fibroin into fabric. Apart from clothing, Qmonos could potentially be be used to make film, gels, sponges, artificial blood vessels, and nanofibers. The company, a spinoff from Tokyo's Keio University, has applied for 16 patents on its spider silk know-how. It is also teaming up with auto parts maker Kojima Industries to build a plant that can turn out about 220 pounds of the synthetic silk a month. Spiber hopes to have an initial mass production of 10 tons a year starting in 2015.